WASHINGTON (May 24, 2007) -- For the 20th year now, the Rolling Thunder motorcycle rally will come through Washington, D.C., to promote awareness of prisoners of war, military members that have gone missing in action and veterans' issues. Each year, since 1988, military veterans and veteran supporters have rolled into Washington, D.C., on motorcycles, as a demonstration of their commitment to veterans' issues, and as a reminder to the nation's leaders that they must not forget America's lost war fighters, said Artie Muller, executive director of Rolling Thunder, Inc. The Rolling Thunder motorcycle rally will come through Washington, D.C., Sunday to promote awareness of prisoners of war, military members that have gone missing in action and veterans' issues. "This is not a ride, it is a demonstration," he said. "We started this for the POW⁄MIA issue. For all past wars, a lot of live Americans have been left behind. My friends and myself wanted to do something about this." What they did was organize a motorcycle run that over the last 20 years has grown from about 2,500 participants to an estimated 400,000 last year. "It just gets bigger and bigger each year," Muller said. "This year it will be astronomical." This year, motorcyclists from all over the country will again converge on Washington, D.C., and gather Sunday morning at the Pentagon, for another run through the nation's capital. Bikers will begin leaving the Pentagon around noon, travel around the National Mall, past the U.S. Capitol, and then to the Vietnam Memorial. While many in this year's rally are members of Rolling Thunder veteran support chapters from around the country, membership in the organization, or even status as a veteran, is not a prerequisite for participation. "If anybody is interested, you are welcome to ride," Muller said. "If you love your freedom, come ride with the veterans." Muller said participants in the ride come from all over the United States, as well as from countries like Australia, England, France, Germany, Norway and South Korea. Riders from Bolling Air Force Base, Andrews Air Force Base, and other military installations in the National Capital Region will ride this year, for the second time, as part of the Green Knight Mentorship and Riding Club at Andrews AFB, said Club President Tech. Sgt. Brian McLeod, 316th Logistics Readiness Squadron. "We're kind of a mixture of the Air Force from Bolling and Andrews AFB, and the Pentagon, as well as some Navy and Army folks," he said. "I believe we are one of the only motorcycle clubs for the military in the area." Last year was the group's first ride in Rolling Thunder, and also the first year for the club. They now have nearly 40 members in the group. 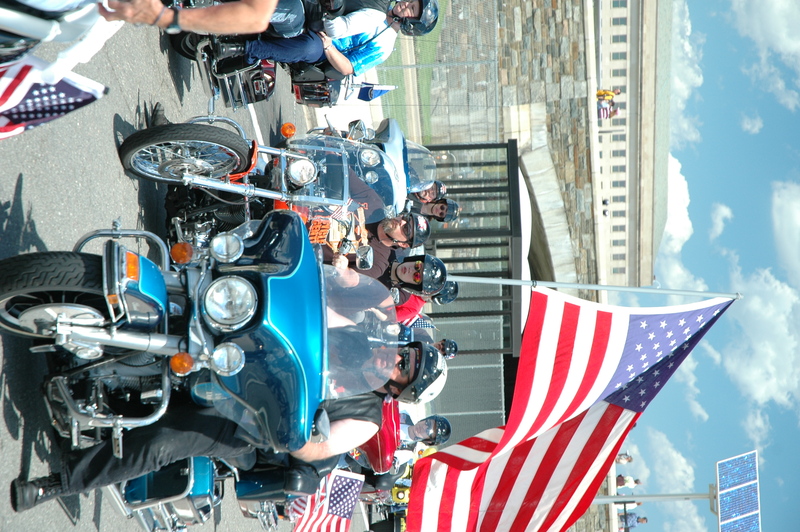 Motorcyclists choose to ride in the Rolling Thunder rally for many reasons. Sergeant McLeod said he rides because of his relationship with the military. "Considering we are all in the military, this could happen to any one of us," he said. "This is definitely a great cause." Sergeant McLeod also said he wears a POW⁄MIA bracelet that bears the name of a military member with his own last name. Though he said he has no relationship to the lost soldier, he does feel it is a reason for him to participate in the rally. "I think everybody has somebody in the back of their mind that kind of encourages them to do something like this," he said. Christopher M. Orbits, 11th Wing Safety Office, will also ride in this year's Rolling Thunder demonstration. He said he'll be keeping the three currently lost U.S. Army soldiers in mind as he rides. "Look at the three soldiers missing now, just on the news yesterday -- we have soldiers looking for them," he said. "They won't stop till they find them, and this ride kind of brings that to the forefront." The three U.S. Army soldiers: Pfc. Joseph J. Anzack Jr., 20, of Torrance, Calif., Spc. Alex R. Jimenez, 25, of Lawrence, Mass., and Pvt. Byron W. Fouty, 19, of Waterford, Mich., all went missing earlier this month. "This ride is one way to educate the public and let people know of our POW⁄MIAs, and things we can do in the future to make life easier for them," Sergeant Orbits said. This year, Sergeant Orbits will ride with his father and a friend of the family, both Air Force veterans. Sergeant Orbits is also getting ready for a deployment to Iraq. When he returns, he said, he will join up with the Green Knight Mentorship and Riding Club. Tech. Sgt. Lester Nelson, 11th Civil Engineer Squadron, rode in the demonstration last year, but won't be riding this year. Instead, he'll be on foot, providing security for motorcyclists as they cross the bridge into Washington. "We're going to kind of line the bridge to keep observers from running around the bikes," he said. "Observers want to reach out and slap hands with the riders." Sergeant Nelson said one reason he participates in the event is his family's history with the military. His grandfather was in the Navy in World War I, his father was in the Army in World War II, his mother was in the Nurses Corps, and his second oldest brother is a retired Air Force Master Sergeant. Last year was Sergeant McLeod's first ride in Rolling Thunder. He said after the ride, he has a better understanding of why they call the event "Rolling Thunder." "That many people riding their cycles, it sounds just like thunder, and the noise doesn't stop for hours," he said. "You kind of get done with it and think 'what in the world did I just do?' And that's kind of a powerful feeling."